Early Pregnancy Test is commonly known as the EPT Test. The EPT pregnancy test lives up to its name. So if you are looking for the right pregnancy test to decide whether you need a doctor’s appointment, EPT is the one you can rely upon. EPT Test is best known for its accuracy; it can detect pregnancy accurately five days earlier than other brands. It is sensitive for the slightest rise in hCG production. 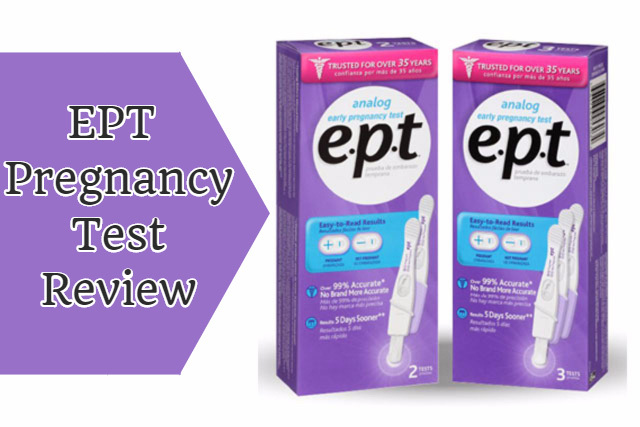 How to use EPT Pregnancy Test? How to read an EPT Pregnancy Test? How does the EPT Pregnancy Test work? EPT is easy to use and gives the most accurate results. The EPT Pregnancy Test has everything a woman needs for shaking off all her doubts about being pregnant or not. The results of a pregnancy test can either make you the happiest or shock you, but a false result goes only one way – and that is inviting havoc. So every woman needs a precise and accurate pregnancy test that is easy to use. But another thing we all have in common is that we need a lot of choices to decide from and a lot of discussions before doing that. So you can relax and read this review to get all information about the Early Pregnancy Test. We did mention about options earlier, so you get two kinds of EPT Pregnancy Test. The second one is the conventional Early Pregnancy Test (EPT) with the hCG strip and the plus or minus symbolic result display. If you use the digital EPT Test, then you just need the Digital Early Pregnancy Test kit. You get two kinds of packaging of EPT Pregnancy Test Cassette either as a set of three tests or two tests. Whether you are using the digital EPT or the cassette Early Pregnancy Test you’ve to follow the same procedure. They only differ in their result display. However, we cannot guarantee that the time slots for reading the results will be standard. They keep developing better pregnancy test tools, and so the specifications might change. Get up in the morning and have your reminder set for taking the Early Pregnancy Test. Take the Early Pregnancy Test kit along with the other essentials you’ll need. If you want to do the midstream test, then bring the hCG strip (paper hanging out of the tip) in your urine stream up to the marked level. For those who want to do the dip strip test collect the urine sample in a cup and dip the strip. Make sure you dip it precisely for the time mentioned in the instructions manual inside the EPT. Take out the EPT and place it facing upwards on a clean surface. Allow the EPT Test to develop the results and read them within the time slot allotted. For the Digital EPT kit, you don’t need to interpret the results. The results read the conclusions of the test. Pregnant or Not Pregnant is the phrase that comes up as results of EPT digital pregnancy test. A single blue vertical line in the small result window: This is the control line. It means that your Early Pregnancy Test kit is in ideal conditions. A blue horizontal line in the bigger circular result window: This is the minus sign. It says that the result of the test is negative. You are not pregnant. It is the EPT negative pregnancy test. A second vertical blue line and a crossing horizontal blue line in the bigger circular window. This is the plus sign. It says that your pregnancy test has positive results. You are pregnant. Faint positive pregnancy test EPT is still a positive result. Very faint positive pregnancy test EPT is because you took the test too early. If you are doing the midstream pregnancy test with the Early Pregnancy Test, then be careful about not crossing the maximum mark. For the dip strip test with EPT Test, take a fresh disposable cup. Read the results within the allowed time. Even if you get a faint positive plus sign, it is positive. Keep the Early Pregnancy Test facing upwards. Do not dip the strip for longer hoping to get better results. Timing and handling of the EPT Test kit are crucial. If you place it upside down or drop it, it will hamper the credibility of the pregnancy test results. Also, one thing important to mention here is, all these over the counter home pregnancy tests are preliminary. They cannot surpass a medical professional and expert. Always take a second opinion from a doctor if you suspect something. This Test is also like any other pregnancy test. It has an hCG strip with hCG antibodies. These are small particles that can bind to hCG and give color to show its presence in the urine. The hCG hormone is the pregnancy master hormone. It comes in your urine once you are pregnant. Ideally, it should double every 48-72 hours, but this may vary from person to person. Read more: How Does A Pregnancy Test Work? Early Pregnancy Test(EPT) can detect pregnancy five days before missed periods. So it is a very sensitive pregnancy test. Regarding accuracy, the test five days before periods is 50% accurate. This is not the EPT defect; rather it depends on your body’s rate of hCG production. So as you come closer to the day of your expected periods the accuracy of the test increases and goes beyond 99% once you cross the date of the due period. EPT early pregnancy test doesn’t affect the EPT test sensitivity. The EPT Pregnancy Test is a relatively accurate and sensitive test. The best feature being the cap and handle dimensions and grip markings which make it very easy to use. Also, it is affordable and gives you two choices depending on your comfort level. The results are clear, and the separate result windows make it even better. The EPT Test is a recommended product. Previous articleWhat To Do After A Positive Pregnancy Test? Next articlePregnancy Test At Night Or Morning?